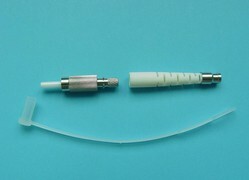 This unique DIN fiber optic connector gives high performance in a small, DIN 47256 compatible design suitable for a wide range of applications. The DIN connectors are made of precision screw machined nickel plated brass for consistent performance and durability. The DIN connector is available with a variety of boots. The DIN fiber connector comply with CECC 86 135-801 (PC version) & CECC 86 135-802 (APC version) standards. We supply single mode DIN connector and multimode DIN connector. These DIN fiber connectors are widely used in telecommunications, CATV, LAN, MAN, WAN, test & measurement, industry, medical and sensors.